Stay in one of the original charming and historic homes in beautiful downtown Cayucos. 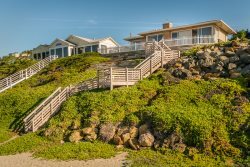 This 3 bedroom 2 bath beach home with peek-a-boo ocean and pier views is just 204 steps to the pier, ocean, and downtown Cayucos. The home retains its old world charm with original hardwood flooring, arched windows and hallway entrance,original cielings and front door. Enjoy your morning coffee or an afternoon glass of wine on the front porch while the sun sets. Then retire to the rear deck to BBQ under the canopy of a fruit bearing avocado tree. Great for a family getaway. Amenities: Private Parking in rear, charcoal BBQ, 42" flat screen TV with DVD player, washer/dryer, central heating, rollaway twin bed, cable and internet. they were all kind, welcoming, and informative. a wonderful vintage home with all modern conveniences in a great friendly beach town. We loved the location and the house is very cute. Would like to see new bedding and bathroom linens. Other then that we love it!!! Everyone was a delight to speak with very helpful. Very knowledgeable of the area. The home was wonderful. Cute back patio and front deck both with a table and chairs. 3 good sized bedrooms and two bathrooms. Heat living room with view out to street and front deck. The dining room was separate and had a great view out the windows. Great experience...great rental! Everything we needed and more. Thank you so much!